The NRSV is about to be available in a thinline edition, which I think may be for the first time ever for that translation. In mid-October, HarperOne will be publishing a thinline NRSV in editions with and without the Apocrypha/Deuterocanonicals. As mentioned on this blog on numerous occasions, I have always wanted a thinline Catholic Bible. So, needless to say, I am very excited about this release. As far as I know, there has never been an official thinline edition of the NRSV-CE, RSV-CE, NAB, JB, NJB, DR, CCB or any other English language Catholic translation. Am I wrong on this assertion? So, this leads to my question that I propose to you: If you could add one thing to the NRSV Catholic Thinline which is not included in the October releases what would it be? Let's not go with the old standby "crossreferences" since that seems too easy of a choice and something that most NRSV publishers seem unwilling to undertake. Really, the NRSV is bad. Both the NJB and NAB are superior (and that's not saying much). I just don't believe "newer" automatically means "better" or "more accurate". I would like to add a version with large print. But is that even possible? Problably would no longer be a thinline. The 9 point type sounds like a nice compromise. Aleady have the version with the Deuterocanonical books on pre-order at Amazon. Love the NRSV translation and it has become my primary bible for daily devotion and studying. Sharon in Waxahachie, Tx. I would add a lectionary guide at least for Sundays and Solemnities (daily ideal) and a guide or concordance of sorts to Scriptural references for Catholic doctrines. Also I like it when Bible have some art in them, need not be a lot, and a thin-line could easily make use of “holy card” size and type of religious art. I think religious art says “Catholic” more than many other “attractions” do. I am going to do my best to NOT but in Oct but to wait until Feb. Honestly, what is the problem with adding cross references to any of these NRSVs? I know, just from personal experience, that I will use a Bible much less without them. Yeah, that would be #1 request, but since almost all editions of the NRSV lack cross-references, I don't have high hopes that this one will. But yes, that would be my first request as well. Thanks to Harper One for putting out these Thinlines. However, I will have to pass on them all. It may be personal preference but I can't take the goofy gender stuff (odd plurals, depersonalized ones and non-English compromises simply call attention to the oddity, IMHO.) I'll have to keep waiting for a non-feminist translation. But when I get one, I hope it has all these features plus a lectionary. The problem with adding NRSV cross-references is that most cross-reference databases omit the Deuterocanonicals. In fact, the only one I know of is owned by Oxford -- who did, in fact, publish a NRSV reference edition. I want to bring the following deal to your attention -- $40 for a NOAB 3rd edition looseleaf. I bought mine for $80 and use it all the time. 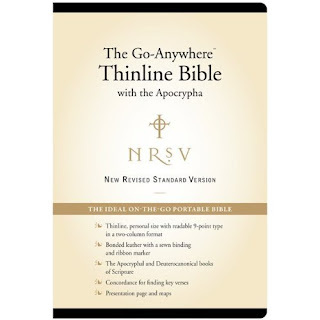 There have been several NRSV thinlines published in the past. When I go home, I'll look some up. I don't know if they are still in print, but the HarperOne edition is not the first. I would be interested in seeing an earlier NRSV thinline. I imagine that perhaps one was produced in the 90's? No, the one I am thinking of came out in 2005 from World publishers (which was bought by Thomas Nelson) -- it was part of their "ultra trim" line and it was 7/8" thick. (It was quite a compact edition -- it was 6 1/2" x 3 1/4".) It is out of print now -- but there are quite a few different editions available used on Amazon -- search for "NRSV ultra trim" and be sure to check for different editions (it came out in burgundy or black leather and with/without zipper and with/without Deuterocanonicals). If you can't tell, I rather like small Bibles for portability. For me, the big issue with thin Bibles is the opacity of the paper. If the paper is opaque, I can forgive many other flaws in the design. I'm hoping the Harper edition uses opaque paper, but I'm not optimistic. By the way, what is it with the NRSV-hate on this comment thread? I'm well aware that some people don't care for the NRSV -- but this wasn't a post on the merits of a particular translation, it was a post on book design! It seems to me that the volume of invective against the NRSV is really testimony to its success: if it weren't such an important translation, why bother with the raspberries and cat-calls? To Theophrastus Re: your comments pertaining to the NRSV translation. I have noticed the extreme hostility to the NRSV translation not only here but on Catholic Answers also. It is on the USCCB approved translation list and I personally find it a very beautiful translation. Thanks/Sharon in Waxahachie, Tx. IMHO, it simply comes down to the issue of inclusive language. I know that I avoided the NRSV for years simply on that issue. As I began to actually read it, I began to appreciate what the translators were doing. Is it perfect? By no means. But it is a very readable, formal equivalence translation that utilizes the most modern textual discoveries. Plus, whenever they stray from a more literal or non-inclusive rendering, there usually is a textual note that will alert the reader. For me, the NRSV cannot be separated from the textual notes, which is why they are in every NRSV edition.....not to mention the St John Bible project. I have just found your blog and am enjoying it. I am wondering if there is anyone in England blogging about the Catholic Bible - do you know? I am currently researching what new Bibles the Catholic population here might like/need, in terms of both translation and design. I am unaware of any UK Catholic Bible blogs. To be honest, I don't know many blogs in general that deal with Catholic Bible editions, versions, and translations as regularly as mine. I started this blog about two years ago precisely for that reason.